How can you be absolutely certain you have all the critical gear you need for survival? To be confident there are no more survival items left to acquire. You can’t – unless you have The Complete Survival Gear List. An extensive list to ensure you don’t overlook any life-saving gear. While it’s unlikely anyone forgets a survival knife, there’s lesser known survival gear you’ve likely overlooked. That’s why we created The Complete Survival Gear List. It’s a list to start, track and grow your survival tools and equipment. A list to help you build your complete survival arsenal. To be 100% confident you’ve got everything you need for a survival emergency. However, this survival gear list will only cover gear and not supplies. What’s the difference? Supplies are items you use up or consume – supplies are not tools and they’re not gear. For example, food is a survival supply, while a knife is survival gear. This list will also only cover gear that’s portable. So while some may consider a large home generator “survival gear”, we put added that piece of gear to our Prepper’s Checklist. So make sure to read our Prepper’s list and our Bug Out Bag Checklist for items in those categories as well. Want a Downloadable and Printable Version Of This Survival Gear List? Click Here To Get Your FREE Copy Of It. As always, we start with water because it’s a player in nearly all major emergencies. So you need gear to turn questionable water into drinkable thirst quenching H2O. The good news is this one is straightforward; we recommend getting a Sawyer Mini Water Filter. You never want to be forced to drink nasty water. We’re talking sewage-filled, bacterial laden water that can make you sick. Instead, grab a couple Sawyer Mini portable water filters. They’re designed to remove microscopic particulates and dangerous bacteria from suspect water. Couple one with some water purification tablets and you’re ready for most water-related emergencies. Drink with confidence. For even more detailed information check out Sawyer Mini review video below. If you ever need to survive in the wild or on the move, you’ll need to carry water with you. Get a metal one with a single wall only (no double wall insulated ones). Metal allows you to boil water over a fire in a pinch but heating up a double-walled bottle can cause an explosion! Occasionally, water takes a back seat to shelter. 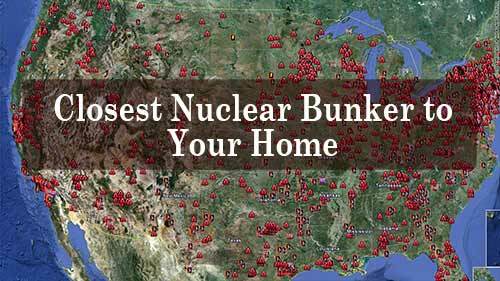 Extreme temperatures and weather make finding shelter into your number one survival priority. So you can either pray you’ll stumble across a natural survival shelter (or an abandoned cabin in the woods) or you can get invest in some lifesaving shelter gear. Tarps are an excellent shelter option. But a cheap tarp will not do. You should invest in a high-quality, waterproof, rugged, ripstop survival tarp with ample anchor points. A good survival tarp allows you to structure different shelters setups to keep wind, rain, sleet, and snow off of you. For even more detailed information check out our post on survival shelters, where share more tarp shelter configurations. OK, if you live in cold regions a tarp might not work well in the dead of winter. Instead, you might want to upgrade to a cold weather tent or a canvas tent. These tents are not the lightest piece of survival gear; heck most will be over 10 lbs, but it will keep you warm and alive in even the worst of conditions. These are the tents extreme mountain climbers use to keep safe at high altitudes. For even more detailed information check out our cold weather tents post – as well as our survival tent post. Hammocks are not just for the beach; they can also be for survival. These keep you up off the ground so you could sleep high up in a tree if need be. Some can be rolled up into a compact ball and don’t weigh much. A hammock tent is an excellent option between a full tent setup and a survival tarp. Finally, there’s the TACT Bivvy. It’s an emergency blanket (or bivy sack) that can be added to any of the above shelter options. This piece of life-saving gear weights under 5 ounces. “Lifesaving,” you ask…absolutely. When you hop in this TACT bivvy, it traps your body heat to keep you warm even in frigid temperatures. I tested one during freezing temperatures outside and was sweating after just a few minutes. The internal temperature in the Bivvy reached the mid-70’s! I wish every car and truck manufacturer put one of these TACT Bivvys in everyone’s glove box. It saves lives when people get stuck overnight in blizzards. Here’s my video review of the TACT Bivvy. Next up is survival weapons. Wait! Are weapons considered gear? These weapons are not survival supplies (however, ammo is). So let’s cover some common and some lesser known survival gear you can use to protect and defend yourself. Weight, ammo availability, accuracy, ruggedness are variables you must take into account. Just make sure you have enough firepower to protect and defend yourself and your family. While a bore snake is not a weapon, it does belong in this category. It’s a must-have for anyone who owns a firearm. If you want your weapon to fire when you pull the trigger and maintain its accuracy, you got to take the time to keep the bore clean of build up. Instead of listing all the homemade weapons you could make and build, I just added the entire category to this list. I’ll also point you to a homemade weapons post that goes over many homemade weapons you can create. 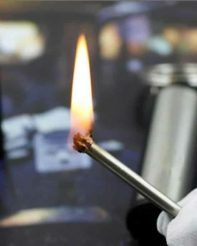 From homemade flamethrowers to homemade tasers and shivs. When hunting or defending; silent and deadly = awesome. Don’t get me wrong, you gotta have firearms but if you’re in a survival situation where stealth is crucial, then give me a good survival bow. I like having the option to shoot wild game (or dangerous threats) silently if need be. The “thump” of an arrow release is a whisper compared to the “bang” of a rifle. Here’s a post detailing 16 reasons why you want a survival bow. Maybe I’m just a sucker for good survival movies and TV shows, but I love the idea of owning a survival crossbow. You get all the benefits of a survival bow with the benefits of trigger shooting. A solid choice and a worthy addition to a survival gear list. Not my personal “go to” weapon of choice, but I’m also not a tactical pen-wielding master. I’ve seen videos on tactical pens being used for self-defense, and they are lethal in the right set of hands. I do keep one in my everyday carry pack as a backup. I hope I never need to use it, but I know its close by just in case. Plus, at the time of writing this post, you could pick up a FREE tactical strike pen if you chip in for shipping. Click here to see if the deal is still available. Here’s our guide to using and finding a tactical pen. Tasers are becoming a popular non-lethal self-defense weapon. If you hit someone with a high voltage taser they’re going down hard and fast. They won’t know what hit them and you’ll be able to neutralize the threat or escape to safety. A worthy piece of survival gear for the list. Everyone should own a can of Devil Juice Pepper Spray. A powerful spray that can drop an attacker from as far as 6 feet away. This is important because it’s best to neutralize threats before they enter into close quarter combat. When we posted this article you could get a bottle of Devil Juice for a discounted price of only $9. Click here to see if the incredible deal on Devil Juice is still available. It’s one of those self-defense weapons everyone should own. Firestarting and survival are basically one in the same. Starting a fire in calm dry conditions is one thing. Starting a fire in a blizzard or torrential downpour is a whole different ballgame. You need the gear to help you get a fire started no matter the conditions. The good news is you have a lot of choices in survival lighters. You can go cheap with a standard BIC lighter, or you can go high-tech with a Tesla lighter. Or go with anything in-between like a zippo. The choice is yours. We like the Tesla lighters for survival since they work in wet and high wind conditions. Do you know what the biggest downside is of any of the lighters mentioned above? They all require fuel; lighter fuel or battery power. These can run out or go dead just when you need them most. Instead, why not also have survival gear that will almost never run out. Get a quality Ferro rod. This Ferro rod has 12,000 strikes! That’s a lot of fires. Using one takes some practice, but they are worthy of a spot on your gear list. Permanent matches are another form of fire-starting because you can never really have too many firestarters. If you just have regular matches in with your survival gear, your making a mistake. If regular matches get wet, they are worthless. However, a permanent match can get wet and will light no problem. If you are going to have some survival matches (and you should), then you need permanent ones. At the time of this writing, you can get a FREE set of stormproof matches if you pay the shipping. Click here to see if this deal is still available and grab some if they are. Firelaces are one of those pieces of gear you can wear every day. These are shoelaces with mini Ferro rods at the ends. Just loop the striker into the laces, and you’re shoes become a survival tool in their own right. Your shoelaces now double as a survival fire starter. The real secret to starting a fire is not the sparks or the flame, it’s the tinder. Fine, dry tinder makes fire starting a breeze no matter which tool you use to light it. So you need a piece of survival gear that allows you to make tinder. This tinderbox has a fine shredder you can use with dry sticks to create tinder. Just rub some downed sticks across the grate and you have tinder; genius! Some people swear by owning and using a survival shovel, while others see it as unnecessary. But a shovel can do one task that no other bladed tool can do (at least not nearly as well). It can dig large holes and move lots of dirt. A knife cannot do that; a tarp can’t do that; a stick can’t do it. When you need to dig a trench or a foxhole, only a shovel will do. Check out our Best Survival Shovels Guide for even more information. It’s safe to say a fixed blade survival knife is the most popular survival gear for most people – as it should be. The knife is so versatile and can accomplish so many survival tasks. It’s one of the first pieces of survival gear most people get – and serious survivalists own several. Survival hatchets and survival axes are similar in shape and function but not in size. The hatchet is shorter and tends to weigh less, while an axe is longer and has more heft. But both of these pieces of gear perform critical survival functions. They fell trees, and they split wood. And while you can split wood with a good survival knife by batoning, it’s not something you want to do in large quantities. I recommend getting a hatchet with a pickaxe built-in for even more versatility. Also, check out our Best Survival Axe Guide and Survival Hatchet post. I’m a fan of survival multi-tools with a great set of pliers (ones with needle nose pliers preferred). Pliers are another one of those survival tools that cannot easily be replaced by other devices. Being able to grip an object with powerful force and pull or twist can be essential but cannot be replicated using your fingers. Check out our Survival MultiTool Buying Guide. This credit card survival tool has 14 tools at a very reasonable price. The biggest downside is that it doesn’t have a set of pliers. But for those who would rather have a thinner credit card knife or survival multi-tool – you can’t do much better. You have to have at least one good knife sharpener. What good is a dull blade? Close to worthless. You might as well be carrying a spoon around if your blade is dull. So grab this blade sharpener and add it to your survival gear. Earlier we covered some of the highest priority survival items (water, shelter, self-defense) but what about rescue? Sometimes the top priority is to get the attention of others who can provide rescue or medical assistance. A scream whistle will travel a very long distance and get lots of attention for miles. Much further than your voice can carry alone. 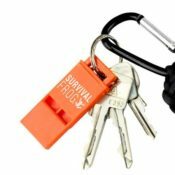 At the time of publishing this article, you could get a FREE scream whistle from Survival Frog – just help out with shipping. Also, take a look at all the Best Survival Whistle options in this post. A signal mirror can serve two vital survival purposes. First, a mirror can signal help to a rescue plan or helicopter. Using the power of the sun to shine a glare towards a rescue team is an excellent way to gain attention. The other survival use of a small mirror is to create a fire. It’s not the easiest way to start a fire, but a focused beam of light on dry tinder will burst into flame. Plus, they are lightweight and take up very little space. Underrated little tool to add to your survival gear list. As anyone from a military background knows, intelligence is everything in emergencies. Without critical information such as weather conditions or roadblock locations, you may find yourself moving in the path of danger – or moving when you should be staying. The more intel, the better. But you shouldn’t put this intel advantage in the hands of electricity or battery technology. Instead, get a hand crank radio so you can generate your own power on demand. Crank for a few minutes, and you’ll be able to tune into any available intel being broadcast over the radio waves. If you’re in a survival group, then you should have a plan to communicate with this group at a distance. Whether you’re talking perimeter security or setting up an ambush – walkie talkie’s are a significant survival advantage. These walkie talkies have a range of up to 2 miles. 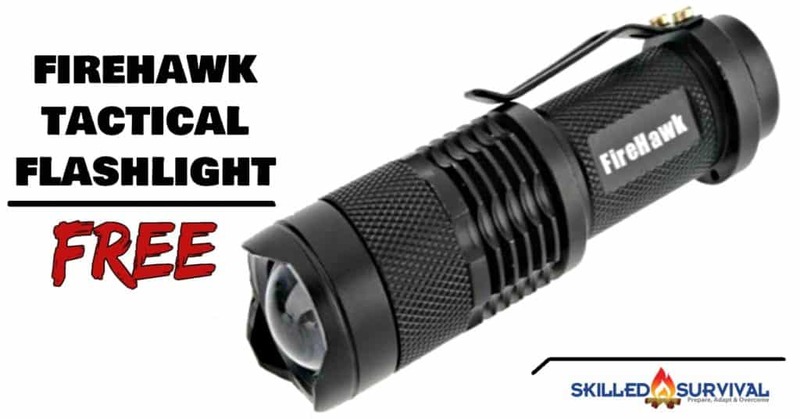 A prepared survivalist is not 100% ready for an emergency without a mean of illumination. Proper lighting is necessary – from moving at night to seeing what you’re doing in a dark basement. Having a tactical flashlight in your pocket is one piece of survival gear that’s NOT optional, it’s essential. Ok, bad terrible joke but it’s true. Illumination should never be underestimated and you should have at least one survival lantern. There are several options to choose from so decide which one makes the most sense for you and then get one. I promise this is the last illumination gear on the list. But headlamps provide illumination in a way that a flashlight or lantern cannot. They allow you portable, focused, hands-free illumination. I can’t think of a way this wouldn’t be a huge advantage in a survival situation. Nowadays, there are many impressive survival watches available. Ones that provide more than just time, they can also provide intel such as temperature, altitude, heading, etc. Plus, we like the survival watches that are tough enough to deal with even the worst of elements like the Rangeman Master of G Series. Check out our Survival Watch Guide, for even more information. Do you need a survival stove? No. Stoves are nice, they can make survival situation easier, but you can cook survival food over a regular fire just as well. However, with that said, there are some impressive portable survival stove options available on the market and worth a look. For example, this bio stove allows you to generate some electricity with a survival stove is a bonus. Read about all 15 survival cooking options here. You might also be interested in getting a tent stove for portable heat in the winter. One of the most overlooked items for survival. If there’s an EMP strike or a disaster with massive fuel shortages, you’ll need a form of alternative transportation. A rugged mountain bike with some panniers or even a small trailer is a good survival idea. Here’s more information about bikes for survival. How much space does a bandana take up in your bug out bag or pocket? Very little. How much does one weight? Very little. However, this often overlooked piece of gear has many survival uses. There’s no good excuse not to include a survival bandana in your survival gear. Survival bananas are a high utility and little weight survival tool. Here’s a detailed post on survival bandanas and their many uses. There are a few emergency scenarios where a gas mask jumps all the way up to the number 1 priority. If you can’t breathe, then you’ll die in minutes. And if you can breathe but the air is deadly, then you may become a member of the walking dead. Not the zombie variety but the sort where your death is coming soon, you just don’t realize it yet. So get a good gas mask for each member of your family and get plenty of gas filters to go with it. Check out our Gas Mask Buying Guide. You can make your own deadfall traps and paracord snares, but it’s easier to snag a meal if you’re using gear designed for the task. So it’s worth picking up a few wire snares and animal traps and learn how to use them. Standard fishing poles are great. But for survival, I always try to find gear that’s lighter and more portable than regular gear. So you should check out these alternative fishing pole options. Get a small fishing tackle box with a few essentials to catch some trout, bluegill, or bass. A few crankbaits, some plastic worms, toss in some catfish stink bait, some lead, some hooks, a bobber or 2 and you’re all set. If you don’t, you’ll have to fashion a hook out of a pop top or whittle one out of wood. And while those methods are fun to try – not one I’d be interested in relying on during a real emergency. Let’s say you’re thrust into an emergency situation where rescue is not desirable. Let’s say you must avoid detection and roaming threats. If you want to get some shut-eye, it would be near impossible without a perimeter alarm system. You need something in place to warn you of trouble in the area. That’s what these cool sound grenade devices can do for you. Want to know about more homemade booby traps? Go here. Survival gear that can help you see objects, animals or threats at a very long range. That’s what I call a superpower. Get a compact pair of high powered binoculars and you’ll have a major survival advantage. If you don’t have them, you’re at a huge survival disadvantage. You likely have a survival knife but probably don’t have a fork and spoon. So get this lightweight, highly portable spork so you can eat a meal with a bit of decency in a survival situation. A low weight, low volume but high utility piece of survival gear. Do you need electrical power in a survival situation? No, you don’t. However, it dependents on the rest of the survival gear on your list. For example, if you plan to use your GPS device or your smartphone a survival tool, then you need a way to charge it in the outdoors. The PowerBank Solar Charger is one of the best portable solar panels on the market. Because without something like this, all your expensive electronic device become expensive paperweights if the grid goes out for an extended period of time. Or you can go much bigger with a portable solar generator. Here’s a video where we look at The PowerBank Solar Charger and why it deserves a place in your pack. A survival saw is a handy piece of gear to own. These saws are lightweight and can help cut good sized limbs fast in a pinch. It’s a lightweight, useful tool so it on the list for those who want a way to cut through wood using a saw. If you’re like me, a belt is the one piece of gear I wear every time I walk out of my house. So I always have a belt with me. So why would I wear a regular belt of limited use? Instead, you should upgrade this daily wear item to one that is has a ton of survival utility. Check out our detailed post on the Best Survival Belts. A bit of a luxury item in a survival scenario but drinking water out of your hands is not convenient. Plus, if you happen to have coffee, soup, or freeze-dried meals you’ll need a bowl or cup to eat these meals. What’s nice is you can get a collapsible one, and they weight nearly nothing and take up minimal space. I keep on in my backpack for my dog. He can drink out of a collapsible cup but not straight out of a water bottle. Dead batteries have thrown many people into survival situations. If you’re out in a remote area and your vehicle battery goes dead, your only option is to start hiking. OR if you had a battery booster you could bring the battery back to life and drive on home with no inconvenience. It’s a piece of gear you don’t realize you need it until you really need it! This one is highly powerful but only about the size of a smartphone. Who knows what the world may look like in a major disaster. Survival is all about preparing, adapting and overcoming. A set of mini bolt cutters gives you the ability to overcome chains and padlocks. Is it breaking and entering? Yes. But if the world is in lawless chaos, there will be no police to arrest you. Not a tool to be used lightly but if you ever have the need nothing can replicate it. Rocks and pebbles can be heavy too, but you don’t have to carry them. You can find them in nature. So while I don’t support slingshots as real self-defense weapons, I do think slingshots have a place in a survival gear list. They can get you a meal without wasting firearm ammo (with some practice) and to me, that’s worthy of a place on this list. Survival pack, bug out bag, inch bag, backpack – all different names for basically the same piece of gear. A survival pack is a bag with straps so you can carry your survival gear on your back. That’s it. Some packs are larger while others are smaller. Others have extra pockets; while some have MOLLE. So choose survival pack that works best for you. See why we recommend The Combat Bag by EVATAC by watching the video below. The uses for paracord is nearly endless. It allows you to bind, cinch, tie, hang, attach, trip, etc. The bottom line is 550 paracord is one essential piece of survival gear. Now, there’ are several ways you can carry cord. One of the most popular ways is via a paracord survival bracelet. But you can also create a paracord donut, or paracord “oh crap” jeep straps, paracord belts, dog collars, etc. Choose your preferred method, and you’ll always have some cordage with you no matter where you go. Here are 17 excellent paracord projects if you’re into making your own paracord items. Every true survivalist should own a high-quality military compass. Forget ones where the needle hangs up or points the wrong direction have the time. With a compass, you can prevent walking in circles and keep a straight heading. If you add a map with a compass (and know how to use them), you’ll never get lost again. What if it’s raining outside, but you need to keep moving. And your hypothermia risk goes up exponentially when you’re in wet clothes. You should add a survival poncho with a hood to wear in outdoor related emergencies. It’s your best portable shelter option in certain conditions. You need to be able to treat some minor injuries in any situation. Medical gear such as bandages, antibacterial creams, painkillers, blood clotting sponge and a tourniquet. Obviously, if you’re on the move, you need a small portable kit. However, if you’re preparing for at home emergencies, you can load up on a more sophisticated medical survival kit. Here’s our detailed “how to build a survival medical kit” guide. Click here to get immediate access to the PDF version of The Ultimate Survival Gear List. I love the post, and the comments… heck the entire site is ingenious. If I could make a tiny contribution it would be the ICSB kit. It’s something I took away from my earliest days in LRS. It’s true that we seem to have kits within kits (hygiene kit, med kit, fishing kit all packed into a bug out kit) but it’s a handy way of compartmentalising our kit for quick access. Being able to access things quickly quietly and sometimes in the dark can be a lifesaver. So I offer up the ICSB kit. Stands for In Case S#$& Breaks. Some of the items are already on your lists but it’s nice to have them all in the same place when something breaks at the least opportune time. It’s a little pouch with duct tape, bailing wire, super glue, safety pins. Zip ties, key rings, buttons, carpet thread, twine, and anything else that is small and fits into this category. Anyway, that’s my two bits. Thanks for all the good info.